What's KAME? Kame is a turtle in Japanese. What's Kame T-shirt. It's orange. Do you remember Orange Tshirts with Kanji letter, Kame, on the back ? One more clue! Dragon Ball! This time, I was a guide of a man from Spain. 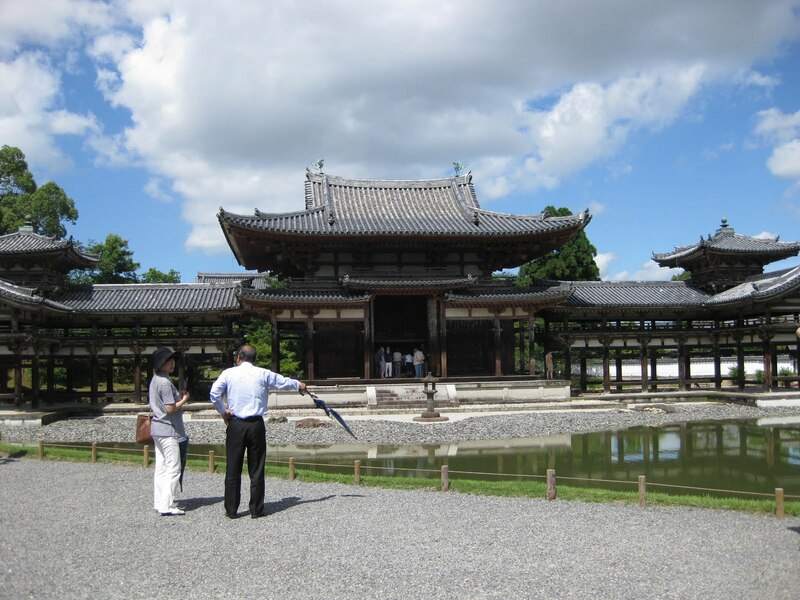 Before we met on the tour day, I saw him in the Old Imperial Palace. His Kame T shirt was so impressive that I really remember someone in Kame T shirt was taking many pictures during the Palace tour. It was him! It was a little surprising to me. How coincident! 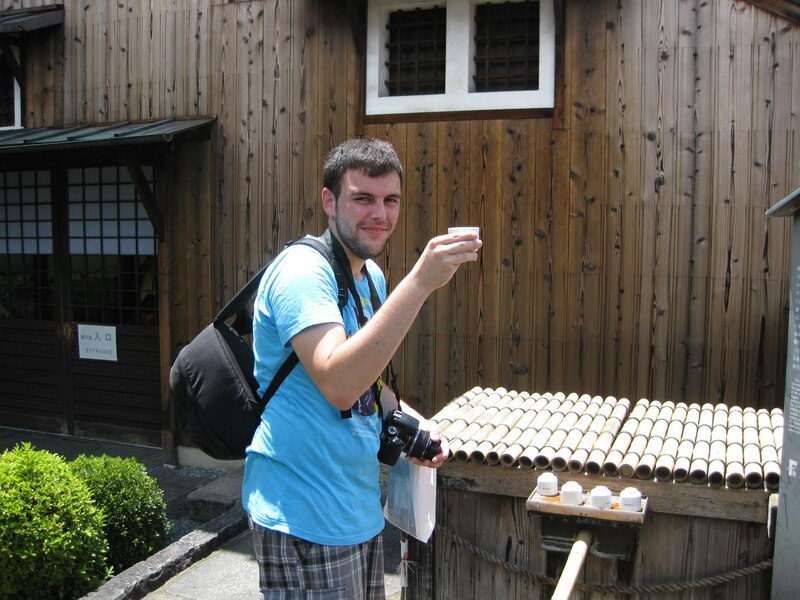 He had been staying in Kyoto for a few days before we met, so he wanted me to take hiim to Uji, Fushimi and Arashiyama( if possible). We visited Byodoin temple. If you wonder what it is like, please look at the back side of 10 yen coin. This is it! 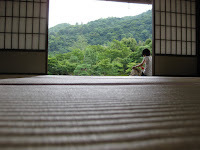 After visiting Byodoin temple, we went to Taiho-an tea house. 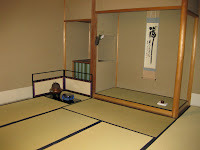 Here, you can have a tea-ceremony experience with 500 yen, though it costs 2500 yen in the center of the city. This tea house is run by the munincipal office, so we can have a class in a low price. However, the tea ceremony itself is authentic. A woman serves tea for us in front of us. Before having tea, we are served a sweet cake. Cakes served in the ceremony vary seasonally. 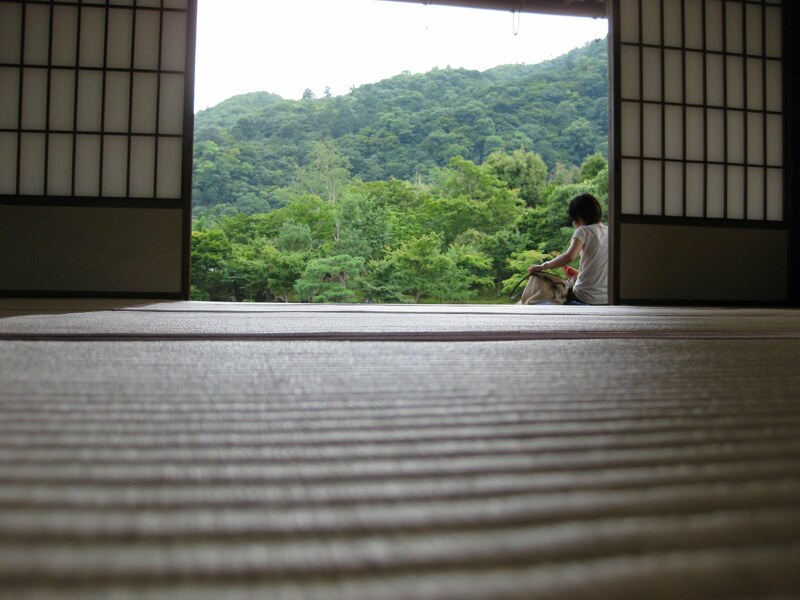 She said that the tea ceremony of the head quater of the school is held in a manner of authentic style. That means they don't have any air conditioning in the real tea ceremony, because in the old time, of course, we didn't have such an appliance. So the people in those days made all kinds of efforts for the guests to make them feel cooler. Visual factors, like a hanging scroll, a flower vase, flowers and the cake itself,are effective. When we see these designs, they show us its coolness. They put a tea cup in front of a guest. At this time the front of the tea cup is set toward the guest. But the guest lift the tea cup and turn a little around on the palm so that she can avoid drinking tea from the front in order not to stain there. Then we went to Fushimi Sake museum. and headed for Arashiyama. We visited Tenryuji temple and enjoyed walking along the bamboo forest. The last leg of our tour was Jojakkoin. Then, the time was up! We went back to Kyoto Station. On the way back to the statiaon, I asked him what was the most impressive place of the tour. He said it was very difficult to pick out one. At last, he chose Uji as the best place.